INDUCTION HEATING INDUCES HEAT ELECTROMAGNETICALLY INSTEAD OF USING CONVENTIONAL HEATING ELEMENTS. Heat is induced in the part by subjecting it to a high frequency magnetic field, creating eddy currents, activating the parts molecules and generating heat. 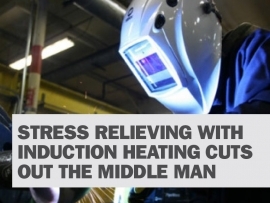 While resistance heating heats the surface of the part, the induction heating process heats within the part. The depth of heating depends on the frequency used. High frequency heats closer to the surface, while a lower frequency penetrates deeper into the part – allowing efficient heating of thicker parts. 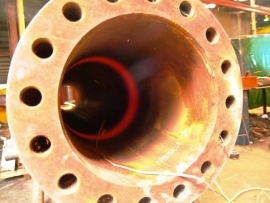 A FREE INTERACTIVE CD THAT PROVIDES A DETAILED EXPLANATION OF INDUCTION HEATING. 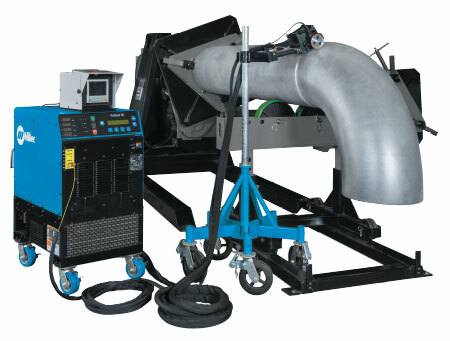 The Pro-Heat 35 Induction System can solve many pre and post weld heat treating applications, delivering fast and consistent heat safely. 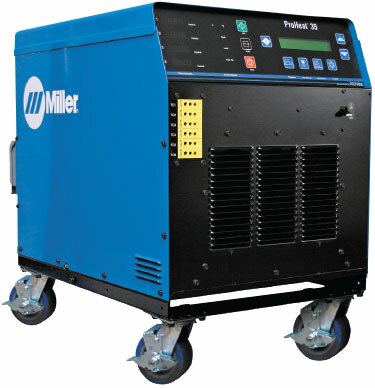 COUPLED WITH THE PRO-HEAT™ 35 POWER SOURCE, THE ROLLING INDUCTOR ALLOWS FOR ROTATING PARTS TO BE HEATED SAFELY, QUICKLY AND EFFICIENTLY ELIMINATING DANGEROUS OPEN FLAME PROPANE BURNERS. 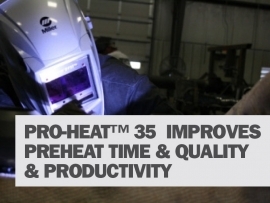 Pro-Heat 35 offers controlled, uniformed soaked heat eliminating open flame heating process improving productivity, quality and safety in the workplace. 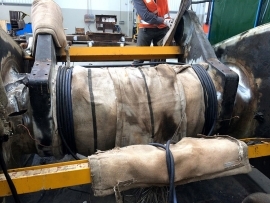 Pre-Heat applied and maintained using Pro-Heat 35 Liquid-Cooled cable configuration for 19 days while welding repairs were performed on mining equipment. 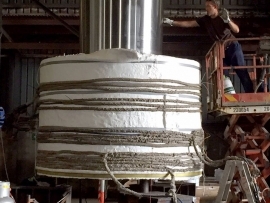 Applying Controlled, Uniformed Soaked Heat to Expand Drum for Removal of Shaft. 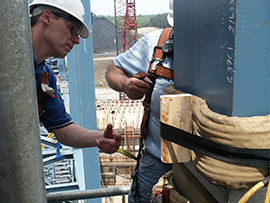 Pro-Heat 35 Liquid-Cooled Cables being applied for Shrink Fit application. Benefits over LPG Flame Heating are controlled, uniformed, soaked heat making this process ideal. 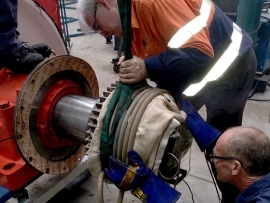 Applying & Maintaining Pre-Heat on Reclamation Welding of Large Mining Roller. 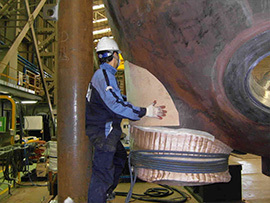 Pro-Heat 35 Rolling Inductor applying and maintaining required pre-Heat prior to reclamation welding of large mining roller. Eliminating dangerous LPG Flame Heating. 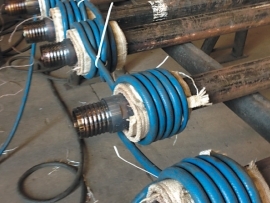 Post Weld Heat treatment application using the Pro-Heat 35 applied on Mining underground roof support Hydraulic Cylinder. Saving 3rd party contractor expenses. 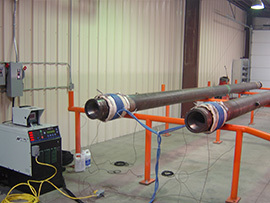 Post Weld Heat treatment application using the Pro-Heat 35 on Mining Drill Rods. Improving customer cycle times. 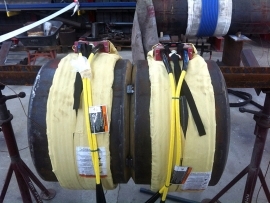 Pre-Heat applied and maintained using Pro-Heat 35 Liquid-Cooled cables on large mining bucket. 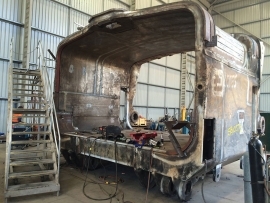 Temperature was maintained for 2 days while welding process performed. 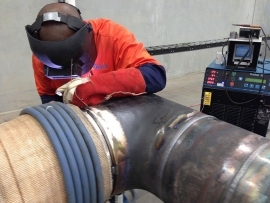 Pre-Heat applied, maintained and recorded using Pro-Heat 35 Liquid-Cooled cables on Chrome-Molly-Pipe while welding process is performed. 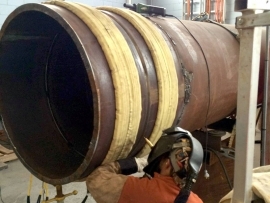 Pre-Heat applied and maintained using the Pro-Heat 35 dual Air-Cooled blanket configuration on gas pipeline while welding process is performed. 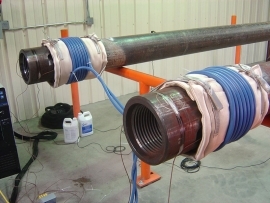 Pre-Heat applied and maintained using the Pro-Heat 35 Dual Air-Cooled blanket configuration on Heavy Wall Pipe. 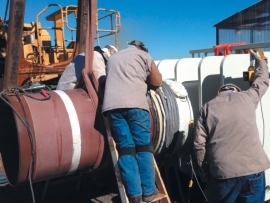 Pro-Heat 35 Induction Heating System operates reliably throughout the year on remote pipeline, mining and construction projects. 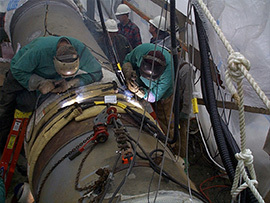 Using 2 x Air-Cooled blanket allows the operator to uniformly heat, maintain and record pre-heat and inter-pass temperature while welding out the transmission pipe. 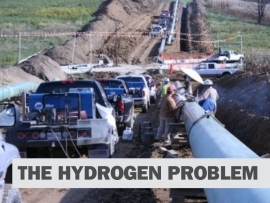 Using the Pro-Heat 35 Induction System could save you thousands of dollars in re-work by getting hydrogen cracking using other heating methods. 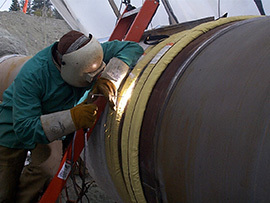 This coil layout is intended to heat the OD of the pipe segment being welded to a large tank at a skewed angle as shown. 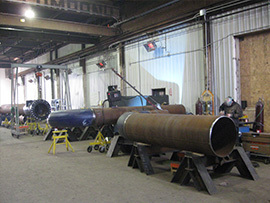 Many pipe spooling fabrication shops require pre and post weld heat treatment to be performed. 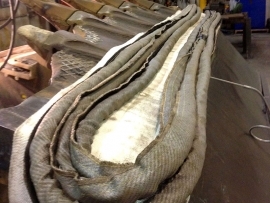 Using the Pro-Heat 35 allows for these processes to be completed in-house by your own staff saving you time and money. The material is P91, which is sensitive to cracking and requires uniform heat control. 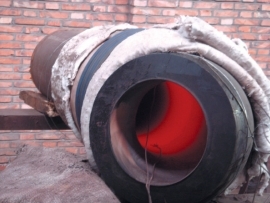 The Induction process is well suited to these applications because the pipe is the heating element, creating a uniform heating of the weld joint. 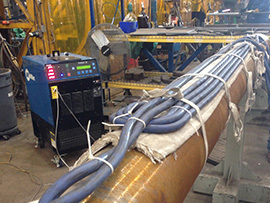 Pre-heating structural steel prior to welding using Air-cooled blankets. 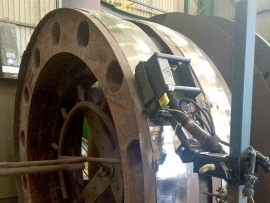 This set up also allows operator to maintain, monitor and record welding inter-pass temperature. 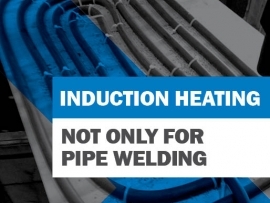 Think Induction is Only for Pipe Welding? Think Again. Check out the Pro-Heat™ 35 or Rolling Inductor product pages to view the full list of specifications. 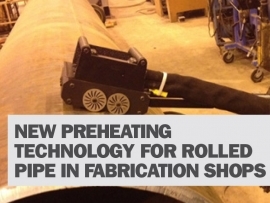 While you're there don’t forget to check out our new Induction Heating brochure!